Isoflex RPUF sandwich panels comes with is highly recommended for Cold Chain application as well and as Industrial Prefabricated application. Cam Lock joints ensure excellent rigidity between the panels especially in Blast freezers where pressure build up is high. The main advantage with Isoflex is that we offer a turnkey solution for your cold chain / prefab requirement. 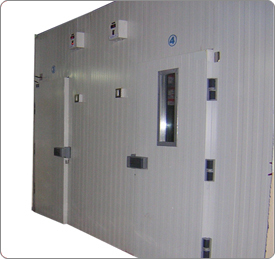 Customers who require a cold room / prefab room have their solution packaged from us that include Panels, Doors, Door fixtures, View Port Frames and Vacuumised Glass, Covings for clean rooms etc. This eases the procurement process where follow up with different vendors is required and thus Isoflex becomes your one -stop -shop.